Shark fishing has resumed at Lighthouse Reef Atoll. This is according to reports made to MarAlliance, a non-governmental organization based in San Pedro Town. The organization is calling on Central Government to make a drastic change in legislation to protect the shark population in Belize. According to MarAlliance, this recent report raises grave concerns about unsustainable shark fishing. “We were informed that [the fishermen] hold shark fishing licenses and further hold the special Managed Access fishing licenses meant for long-time users and traditional fishers of Zone 7 / Lighthouse Reef Atoll…The shark fishers have refused to vacate private land that the owner has asked them to vacate through the intermediary of his manager in charge. 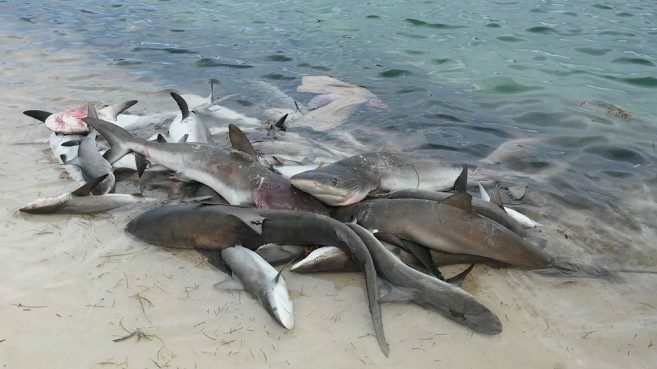 This sets a dangerous precedent for any landowner in Belize…The parting words of the fishers as they left with the remains of more than a thousand sharks were, ‘We’ll be back next year.’ It is clear that they will continue to come back until there are no more sharks left,” said MarAlliance. In 2016, fishers killed an estimated 1,000 or more sharks by using nets and longlines. MarAlliance says that the impact of shark fishing is extensive, and registers a significant drop in the number of sharks. The San Pedro Sun contacted the Belize Fisheries Department (BFD) for clarification on the report. “The shark fishing season is open and is seasonal. The Department has issued 65 Belizean fishers shark-fishing licenses. However, a shark fishing license has specific criteria for each fisher to meet and is not given randomly. These sharks and fins are used for consumption. As shark fishing is allowed in our management, most go fishing for shark in Area 9—which is for deep water fishing. These fishers are given access to most areas, except ‘no wake’ zones are reserves. But it is illegal for someone without a shark fishing license to fish for sharks. The Department does implore on the public to report illicit or illegal activity,” said Ramon Carlton of the BFD. The concern about the rising popularity of shark fishing in Belize is pushing MarAlliance to lobby the Minister of Tourism and Civil Aviation Manuel Heredia Jr, the Belize Tourism Board, and the Belize Tourism Industry Association to address the important issue. MarAlliance has been one of the most active marine conservation groups to help explore, enable, and inspire positive change for endangered marine wildlife throughout Belize. MarAlliance invites the general public to help protect sharks and rays to sustain Belize’s ecosystems and economy by reporting it to the BFD. You may contact Fisheries at [email protected] and ask them to protect sharks and rays in Belize. In the meantime, fishers are advised that it is illegal to conduct shark fishing without a valid Shark Fishing License. The shark fishery is regulated through the application of regulations that are established under Statutory Instrument No. 78 created in 2011. The purpose of this regulation is to ensure the sustainable management of commercial fisheries, as well as protection of various species of marine life. For more information, please contact the BFD at 224-4552. Coral Reef Ed-ventures’ summer camp is back!